The former World War II general and soon to be retired commander-in-chief uses this opportunity to caution the American public "against the acquisition of unwarranted influence... by the military industrial complex." Progress toward these noble goals is persistently threatened by the conflict now engulfing the world. It commands our whole attention, absorbs our very beings. We face a hostile ideology global in scope, atheistic in character, ruthless in purpose, and insidious in method. Unhappily the danger it poses promises to be of indefinite duration. To meet it successfully, there is called for, not so much the emotional and transitory sacrifices of crisis, but rather those which enable us to carry forward steadily, surely, and without complaint the burdens of a prolonged and complex struggle -- with liberty the stake. Only thus shall we remain, despite every provocation, on our charted course toward permanent peace and human betterment. Another factor in maintaining balance involves the element of time. As we peer into society's future, we -- you and I, and our government -- must avoid the impulse to live only for today, plundering for, for our own ease and convenience, the precious resources of tomorrow. We cannot mortgage the material assets of our grandchildren without asking the loss also of their political and spiritual heritage. We want democracy to survive for all generations to come, not to become the insolvent phantom of tomorrow. Down the long lane of the history yet to be written America knows that this world of ours, ever growing smaller, must avoid becoming a community of dreadful fear and hate, and be, instead, a proud confederation of mututal trust and respect. 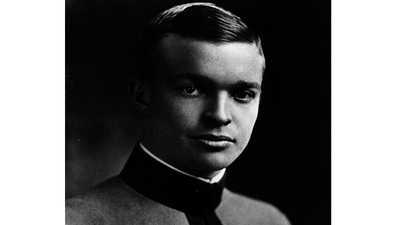 Eisenhower vigorously maintained an air of optimistic dignity, regardless of the crisis at hand. 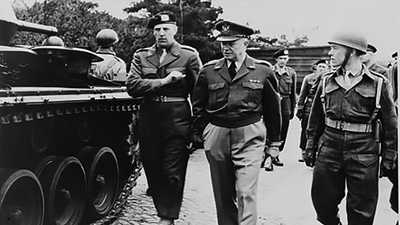 Browse a chronology of major international events that occurred during Eisenhower's presidency. 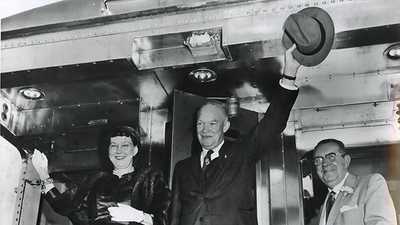 Did you know these seven fun facts about President Eisenhower?